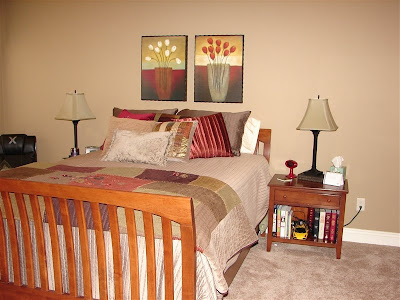 Just another view of the bed. You can see both lamps in this photo. The pictures we found at Target. Tulips are one of my most favorite flowers and I was so excited to see how perfectly they matched everything! 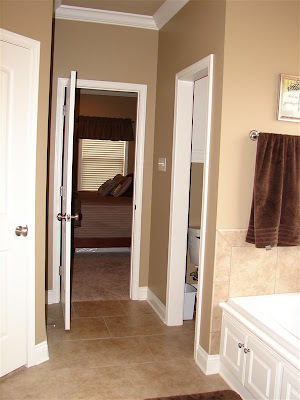 Another view...the doorway there leads to the master bathroom and two closets. Those photos to come later in the post. And another view, here you can see the doorway that brought us in here. The TV cabinet is the old one we used to have in our family room in our old house, so it the TV. Now it resides in our bedroom. It really doesn't get watched all that much. Mostly the girls like to lay in our bed to watch shows or sometimes Jon Paul will go watch something when we're watching something he isn't interested in. And last a view from standing in the bathroom doorway. You can see the second window in our bedroom. 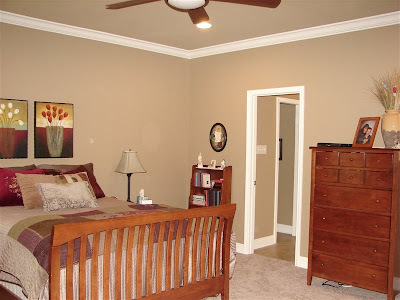 I am currently looking for a nice chair and ottoman or something like that to put in this corner. Currently it and another corner are home to our X Gaming Chairs. Not sure where they will go when I find my sitting chair, but until then, this is where they sit. 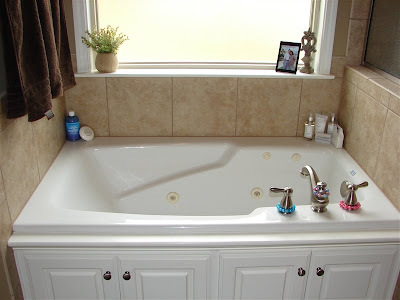 And now we enter into the master bathroom. It is so large! So much better than the cracker jack box bathroom we had before. 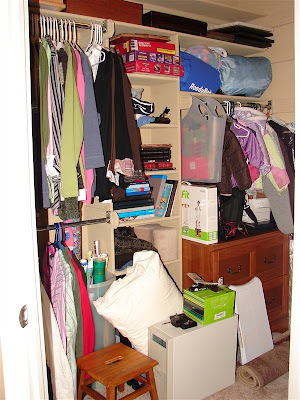 That doorway straight ahead goes to the larger of our two closets. 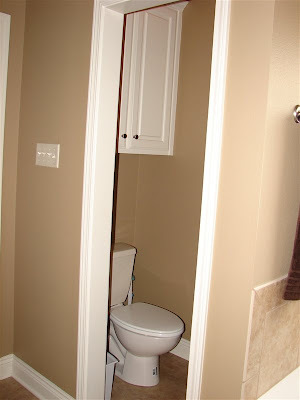 Just after you enter into the bathroom, immediately to your left is a doorway to the toilet room. The plans call for a door to be there, but we opted to not put one there. Neither Jon Paul, nor I cared anything about having a door there. We pretty much have an "open door" policy. I think I would feel somewhat claustrophobic in there with a door closed. 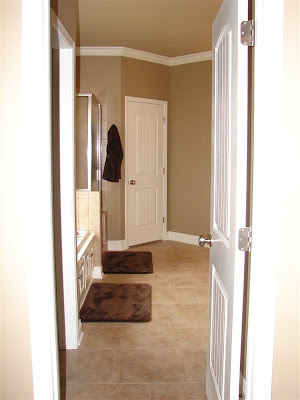 Plus, then you have this door taking up space when its open! Oh well, to each his own! Here you have our beautiful black cabinets. I am so happy with my choice here. They look stunning. And again, we have so much storage space. In our old bathroom, after we remodeled it, I only had three small drawers. Now we have nine drawers and six cabinets! Right now I don't have anything stored under the sinks! And see that tulip picture? Perfect...found that at Bed, Bath and Beyond. 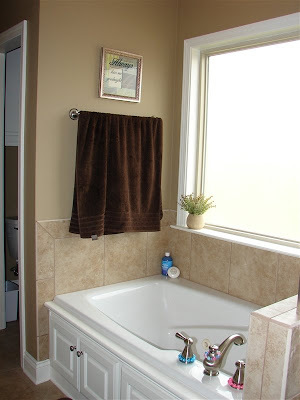 One of my favorite things my sister found, the picture there above the tub. It says, "Always Kiss Me Goodnight." It fit perfectly in here. Oh, and do you see the special decorative touches? The special colorful little things on the faucet? That would be the work of Rebekah. She was upset when I tried to move them. She said, "I make your bafroom pretty, like Aunt Cynta!" Melted my heart and of course, they stayed. 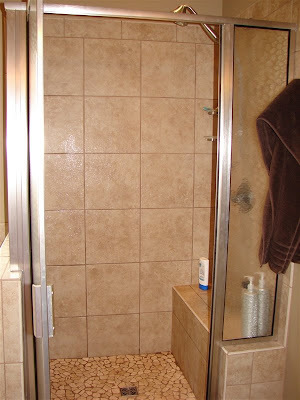 Here is a shot of our shower. We had to put a new shower head in there. The one that was in there wasn't the kind you could take off. Made cleaning the shower and shaving your legs a little difficult (not at the same time!). We really like this new one. I also really like the river rock shower bottom. 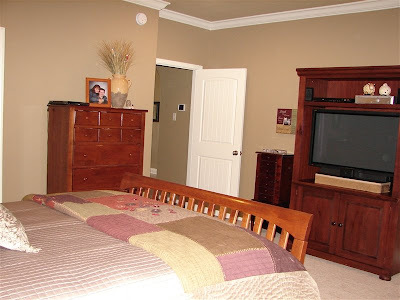 Here is a look back towards the bedroom. 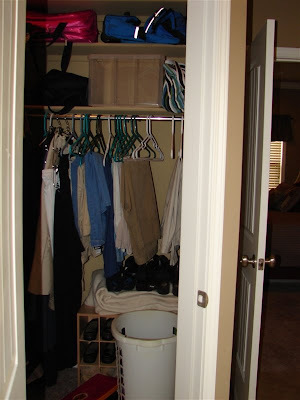 That doorway on the left goes to the smaller of the two closets. 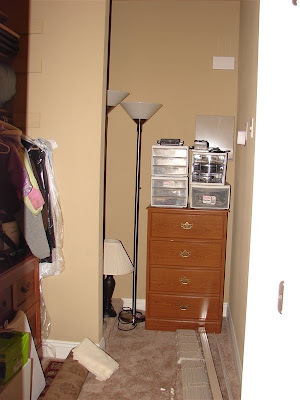 Here is the side storage in the large closet. Just a bunch of stuff! 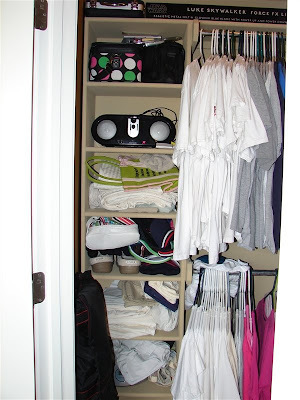 Here is the smaller closet. This is where we have our in season clothes. Yeah, partly arranged by color. Hey, I'm an organized person. Ask anyone who loves me!! 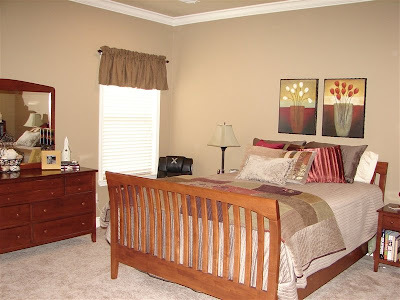 When we had our old house on the market, I even changed out the hangers so that they were all the same color. THAT didn't last long as you can see! 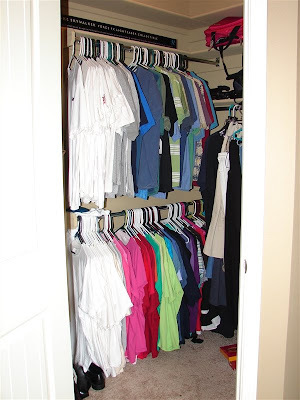 A view of where our long clothes hang. And last, a view of the shelves. OK. 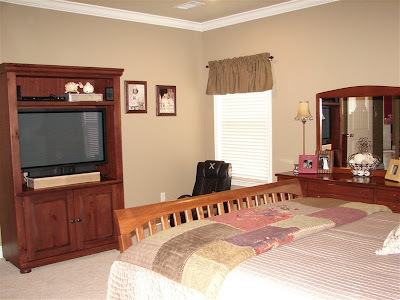 There you have the entire master bedroom suite. Thanks for sticking with me. What's next? We'll move over to the other side of the house! See you tomorrow. BEAUTIFUL! I cannot wait until I can share the same kinds of photos! First I might have to have you come help me decorate though! Gorgeous! 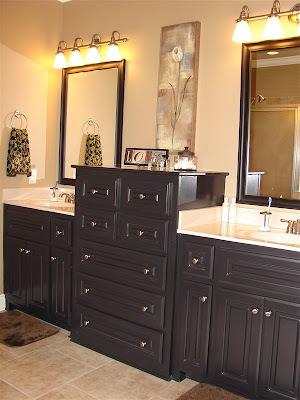 I love your black cabinets in the bathroom!